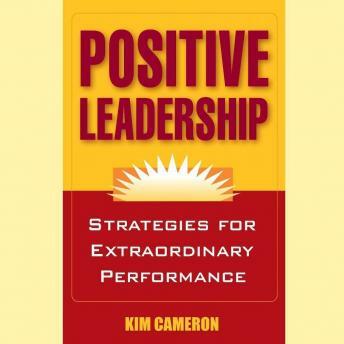 Positive Leadership shows how to reach beyond ordinary success to achieve extraordinary effectiveness, spectacular results, and what Kim Cameron calls 'positively deviant performance'-performance far above the norm. Citing a wide range of research in organizational development and psychology as well as real-world examples, Cameron shows that to go from successful to exceptional, leaders must learn how to create a profoundly positive environment in the workplace. They must build on strengths rather than simply focus on weaknesses; foster positive emotions like compassion, optimism, gratitude, and forgiveness; encourage mutually supportive relationships at all levels; and provide employees with a deep sense of meaning and purpose. In this concise, inspiring, and practical guide, Cameron describes four specific positive leadership strategies, lays out a proven process for implementing them, and includes a self-assessment instrument and a guide to assist leaders in the implementation process.